Far Cry 2. This is what my view looks like, most of the time. It’s “Orienteering – The Game”, basically. 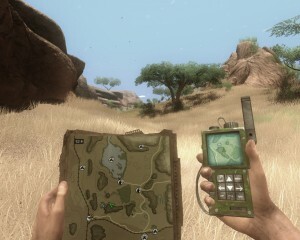 I returned to the Africa of Far Cry 2 after listening to the guys of Idle Thumbs being very disappointed with Far Cry 3. I didn’t expect it to feel so fresh. My initial time with Far Cry 2 was so bewildering that I gave up a couple of times before finally hitting it off with the game. I like to think I would’ve appreciated it the first time, if it came out now. A lot of what it’s doing (from 2008) is so anti-thetical to current (2013) triple-A videogame rules, it’s rebellious, anarchistic. There is no UI save for a flash of health when you take damage or heal, or the ammo counters when you fire or reload. This doesn’t sound like that big of a deal, but it is, immersing you in the game’s world so much more fully when there is no crosshairs, no mini-map, no compass on screen. You need to bring up the map and the compass as an equipped item instead of holding a weapon, if you want to orient yourself. The last few years there’s been a proliferation of ridiculous UI elements – I hear Far Cry 3 is especially bad in this sense, but my pet peeve is with Ghost Recon Online. I love that game, but they’re really going overboard with the “futuristic”, needless UI crap that actually manages to get in the way of playing the game. Everything shines and blinks and zooms and draws vectors all over the place. It’s like the game is afraid of letting you focus on just what’s going on in it for a second and instead seeks to distract you. None of that here. To begin with it can be frustrating how hard it is to spot the enemies in the jungle, but it’s still a novel experience. When was the last time you actually had to look for the enemy, listen for them? In Far Cry 2 that’s “every fight”. Far Cry 2 is all about player agency. You’re dropped in the world and left on your own. You’ve got malaria (resulting in random blackouts), your guns are jamming all the time and everybody wants you dead. There’s a ton of stuff to find and conquer – diamond cases, Jackal tapes, golden AK parts, safe houses – and just going after all that is as valid as running after the quests. This is what initially put me off the game – it’s easy to lose sight of the main questline and effectively become lost in the jungle. Once you appreciate that’s exactly what the game is trying to do, make you feel like a small man in a big, messy world, all your weapon prowess so much inconsequential noise in the grand scheme of things, you wake up, and become free. Of course that freedom is mostly about who you want to shoot in the face, and which weapons you’d like to do it with, but it’s intoxicating all the same. It’s hard to say if the exact same mechanics would work as well in another setting. Far Cry 2 gets a lot out of its civil war torn African country, with the last plane heading out as you head in, stricken with malaria, getting pitiful looks from the locals. It sets a mood. The jungle with its rivers, savannahs, monkeys, zebras and fortified camps makes you explore with very little pushing on the game’s part. When I crossed the first river in my beat-up sedan, there was a very strong urge to just jump out of the car, dive in, and see where the river takes me. The experience does lose some of its sheen once you’ve upgraded your weapons and got your illness in check. It is at its best the way you’re thrown into it, completely out of your comfort zone. Savor that feeling and don’t play safe to get the best experience. But even when you know it all, Far Cry 2 is such a rare success of systems interplay with player actions, it results in unforeseen moments all the time. Then there’s the story, which doesn’t get at all in the way of playing the game, completely backed by what you’re actually doing in the game, the buddy system, the whole reveal of the second map – I couldn’t believe how big this game was when that first happened! – and the powerful ending… Far Cry 2 does so many things nigh-on perfectly, I honestly can’t fault it for its shortcomings. Yes, the respawning checkpoints are a game-y crutch, yes, the buddy system is really superficial despite the emotional pay-off later on, yes, it’s a shame there’s nothing else to do here but shoot guys in the face, yes, the story clearly wasn’t delivered quite as they hoped. And none of that matters. The strongest memory I come back to was the time I couldn’t save a buddy who had rushed in to drag me, dying, out of the fire. His head lying there in my lap, out of medicine, I had no other option but to put him out of his misery. That was a powerful moment, much more so than any scripted cutscene I can think of. We had fought together in very dire situations so many times, when I finally had to admit I just couldn’t help him and that he was going to die… man. The language of videogames is neither spoken nor written. If you haven’t played it yet, do yourself a favor and lose yourself in the jungle. You might not want to come out. It plays perfectly on the PCs of today and still looks very nice with everything maxed out, and is often available for around 5-10€. My initial playthrough was on PS3, and that was equally good save for the inability to save anywhere. It is the only game where I’ve almost reached a Platinum Trophy. I wasn’t found to FC2. Partly because repentitive gameplay, partly because only interesting character is the nihilistic bad guy. Partly because in the end you make a suicide pact and kill yourself by forcing player to blow the chraracter up or it’s just hinted that he shot himself after getting across the border. I find the gameplay very interesting because of all the systems they have going on – the jamming guns, the patrols with their tendency to partake in the chaos, the fires spreading out of control, the malaria striking at exactly the wrong time, the need to pull bullets out your arms with your bare teeth in the middle of a fight… The only repetitive part I dislike is the “engine approaching – toss grenade at feet – turn and run to hear incoming militia dudes blow up”, and even that I find mostly just comedic. While I can’t disagree about the nihilism or the bleakness of the outcome, I really liked the ending and found it elevating. Cathartic, even.